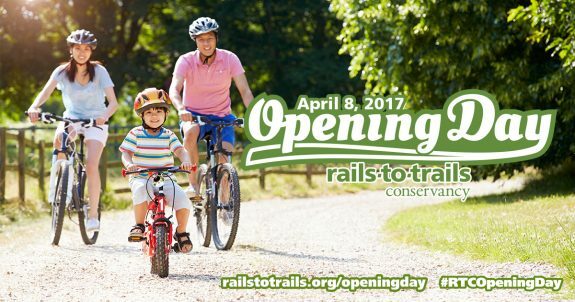 Each year, the Rails-to-Trails Conservancy hosts Opening Day for Trails, a national celebration of all trails. For 2017, the event takes place on April 8th. Of course, trails are open year-round, but the Opening Day event is a nice reminder to get out and enjoy our wonderful Kansas Trails, including rail-trails such as the Prairie Spirit Trail and the Flint Hills Nature Trail, mountain bike trails such as the Gunn Park Trails, the Lawrence River Trails, the Lehigh Portland Trails, and the Switchgrass Mountain Bike Trail. In addition, the Kansas Trails Council has mapped over 3,000 miles of all kinds of trails in Kansas. What amazing Kansas trail adventure are you planning for April 8th?